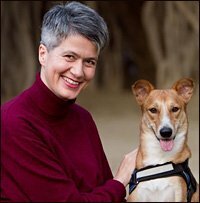 It was great to visit with Monika Schroder (and her dog Frank) at the blog on October 31, 2011. Her YA novel My Brother's Shadow is about a German teen in 1918. You grew up in Germany. When did you learn about the painful history you write about in My Brother's Shadow? I first learned about the time after World War I in school and I've always been a history-nerd. Then, when I began working on the novel I watched an interesting documentary made in cooperation with German and French television channels about the "Great War." It showed footage about the struggles of the social democratic women, who fought for peace and worked against the regime, and also included a section about the veterans and what we now call "post traumatic stress disorder." These images as well as interviews with surviving soldiers about their experiences left a deep impression on me. In 1918, Germany formed a democratic government, which later crumbled as Hitler rose to power. Do you think Germany's democracy could have been saved? The seeds for the destruction of this young democracy sprouted right after 1918. The stipulations of the Versailles Treaty left Germany humiliated and also economically too weak to pay back the demanded reparations. The returning veterans, like Hans in my book, had no work and couldn't find their place in the new Germany. Politically the country was divided between the extreme right, represented by militarists who didn't shy away from violence, and the left. Soon after my book ends, in 1919, communist politicians were assassinated. A civil war ensued and the weak economy helped the rise of the National Socialists who promised a new "strong Germany." In addition, the structure of the Weimar Parliament gave room for too many small political parties, making it hard to form coalitions and maintain a stable government. So, I don't think this democracy could have been saved, too many factors were working against it. You write very sympathetically about hunger. Have you known hungry young people? I lived for eight years in India, where unfortunately poverty among children is a fact of life. I have written about that in my second novel, Saraswati's Way. But I have just moved to western North Carolina and learned that almost 70% of schoolchildren in my county depend on school lunches and charity organizations handing out food bags to secure adequate food for their families on the weekend. A recent national study found "food insecurity" (a strange choice of words) to be a growing problem among children in the US. It seems that hunger is becoming also a sad reality for many young people here in America, one of the richest countries in the world.